One of the places I knew I wanted to sketch while I was in Montreal was Place d'Armes, which is a square in Old Montreal surrounded by quite a few interesting buildings (the Notre-Dame Basilica, The New York Life Insurance Building, the Bank of Montreal head office and more). I came back a couple times to sketch various details. 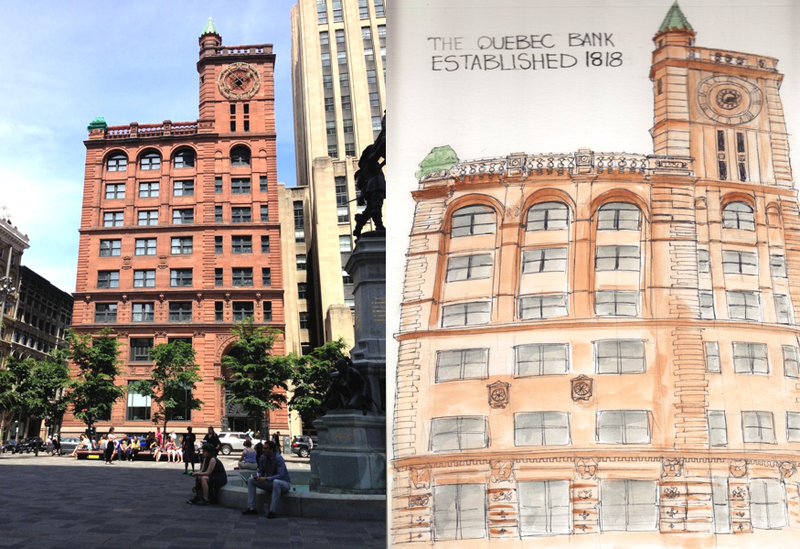 The first building I sketched was the New York Life Insurance building, also known as the Quebec Bank building. I was intrigued by its red colour. I found out later that it was built using red sandstone imported from Scotland. A sculptor, named Henry Beaumont, carves several intricate details on the facade of the building, including several flowers above the main entrance door and grotesque style faces on the third floor. 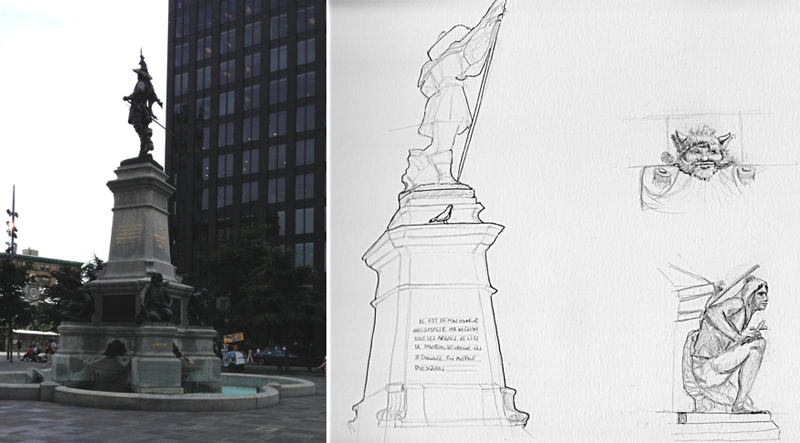 I went back to the square a second time to draw some of the details of the Monument Maisonneuve, located right in the middle of the square. It was created by sculptor Louis-Philippe Hébert in memory of Paul Chomedy de Maisonneuve, founder of Montreal. The figure holding the flag at the top, looking toward the St-Laurent river, is Maisonneuve. He is symbolically supported by four other statues at the base : Charles Le Moyne, Raphaël Lambert Closse, Jeanne Mance and "Iroquois". It's unfortunate that the only statue who has no specific identity is the Iroquois warrior. Considering the fact that Closse also fought Iroquois people at the time, it would have been more sensitive in my opinion to also identify the one warrior who contributed the most to founding the city, thereby differentiating the friends from the foes. 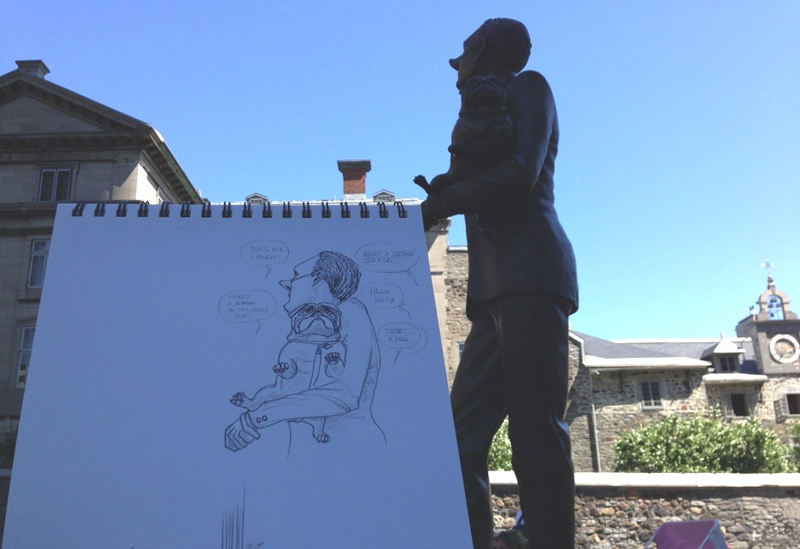 I came back to the square a third time to sketch two quirky sculptures near the 500 Place D'Armes Building. 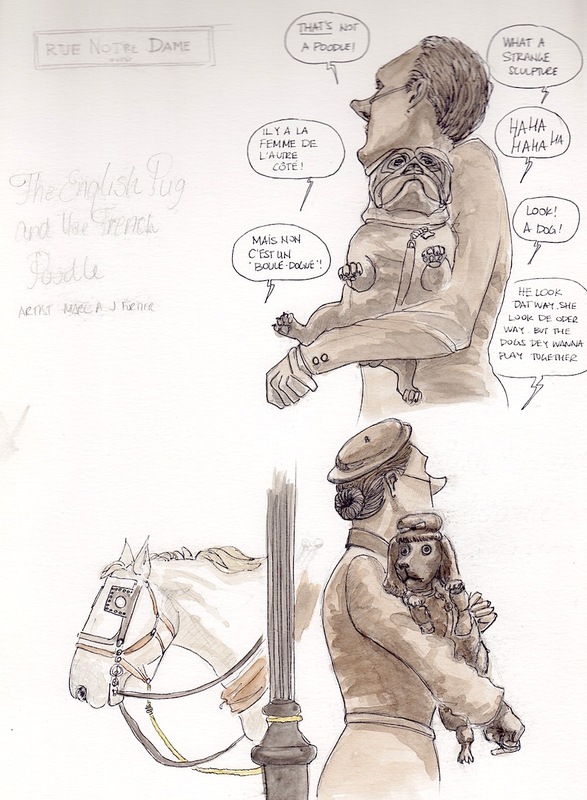 On one side of the building, a man stands looking away holding an English pug. On the other side, a woman stands looking away and holding a French poodle. Both dogs are looking at each other seemingly wishing they could play with one another, while the man and the woman are looking away from one another with their fake nose up in the air. I wonder what the artist Marc A J Fortier had in mind when he created this piece. There's so much that can be read into this and it's so appropriate in Montreal with the language issues popping up every so often. It was also fun to hear some of the comments from tourists as they walked by and noticed these sculptures. I recorded some of the conversations I heard on my sketch. Place d'Armes is also the place where tourist can hop on a horse carriage ride. I had time to sketch one of the horses waiting for their next passengers. I wish I had more time to sketch the elaborate carriages of various colours. There is so much more I could have sketched in this area, but there just wasn't enough time. Hopefully I'll get another chance to sketch there again in the future. 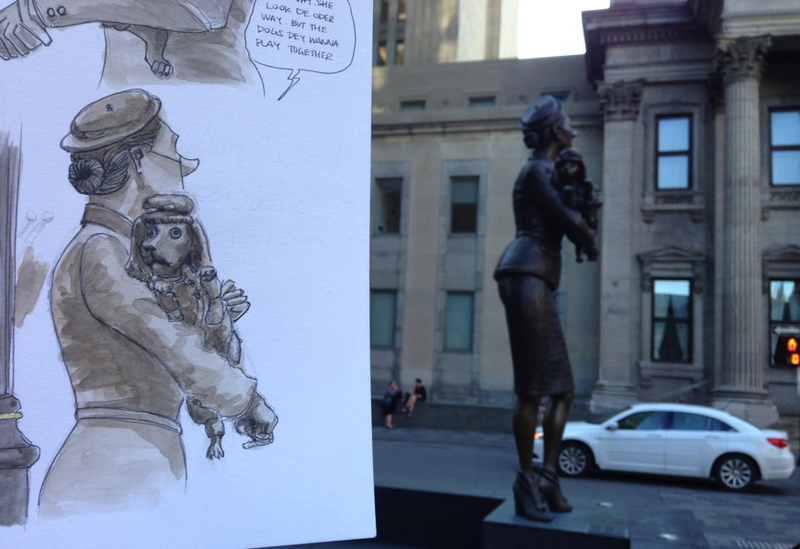 If you're in the area and you're looking for interesting subjects to sketch in the city, I highly recommend Place d'Armes. Cuuuute! et drôles les commentaires! mais j'ai tous compris, les chiens (english -french) eux ils ont le coeur a' bonne place tandis que les "clowns", ben' ils sont caves!! Thanks MJ - hope you are well. Frances!!! I hope you're doing well too :) Il faut suivre l'example des chiens dans la plupart des cas.